When I posted this photograph of Lydia Morrison last October, I had no idea who she was. Yesterday, I uncovered a great deal about Lydia, more then I ever imagined. 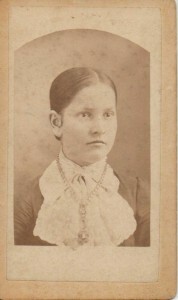 Lydia was the third child born to John and Catherine (Zullinger) Motter. According to her gravestone, she was born in 1867 which corresponds to the 1870 and 1880 census records. Andrew Motter, which I am a direct descendant, would have been one of Lydia’s younger brothers.When you’re working on your family history, you never know what you might find. Usually the family skeletons that have been trapped in the back of closets make for an exciting find. Those skeletons remind us that our ancestors were just as human as we are! While I always have expected to find a hidden skeleton or two, I guess I never thought about finding a real tragedy that may have impacted my ancestors. For some reason, I guess I just thought that nothing really tragic ever happened to my family, because if it had, I would have certainly heard of it. Yesterday while working in the Greene County Room, I decided to play around with our database of the historical Cincinnati Enquirer. The Cincinnati Enquirer was a weekly newspaper that published the most sensational news from across the state and even the country. I decided to put some of my ancestor’s names in the search box, doubting that I would get any hits. I entered several names with no hits and then I typed in John Motter. I was shocked that I had three hits. The first two hits had nothing to do with my John Motter….and then I clicked on the third hit. Below is a transcript of what I read. ADA, June 10–The citizens of this place and vicinity are in a fever of excitement over the most fiendish act ever perpetrated in this county. A tramp, whose name is unknown, and who has not been captured as yet, brutally outraged the eleven-year-old daughter of John Motter, a respected and well-to-do farmer living four miles north of this place. The girl had been visiting a neighbor, and when returning home was pounced upon by the fiendish brute, who lay secreted in a fence corner. That he fully accomplished his purpose there is no doubt. The young child was left almost lifeless in the highway, where she was picked up and conveyed to her home. The people are wild over it, and are scouring the country upon horses and afoot. If he is found and identified Judge Lynch will no doubt prevent any further trouble with him. As you can imagine, I was completely shocked! This was definitely my two times great grandfather, John Motter and this news article was about one of his daughters. I pulled up the 1880 census and determined that Lydia, who was listed as being thirteen, must have been the victim of this horrible crime. The article indicates that she was left for dead, so I don’t know how long it took her to recover physically, not to mention mentally. I plan on checking out some of the local Ada and Hancock County newspapers to see if I can determine if the culprit was ever caught and brought to justice. 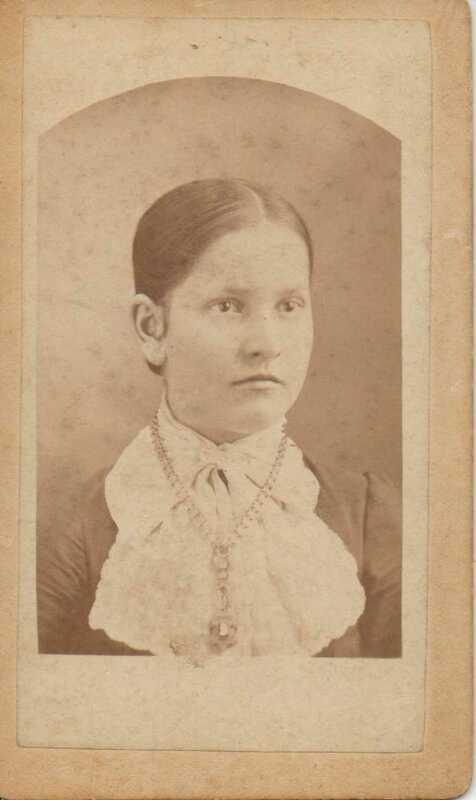 I was able to determine that on August 19, 1885, Lydia Motter at the age of eighteen, married John Morrison. While I don’t know much about the type of life that Lydia had, I do know that she had two children, Lee and Beulah Mae Morrison. Lydia lived to be eighty-seven years old, dying in 1954. I was so upset yesterday when I first found this story, but after reflecting on this for the last twenty-four hours, I am looking at things in a new light. To have endured such a horrible tragedy at such a young age, Lydia must have been a very resilient individual. While I don’t know how this tragedy scarred her, it seems to me that she was able to go on with a fairly normal life. While I have by no means had to deal with such a horrible event in my lifetime, I would like to think that perhaps some of my resiliency has been inherited from Lydia. This entry was posted in Family Tree, Who's Who and tagged Ada Ohio, Beulah Mae Morrison, Catherine Zullinger Motter, Cincinnati Enquirer, Hancock County Ohio history, John Morrison, John Motter, Lee Morrison, Lydia Morrison, Lydia Motter, Morrison family history, Motter family history. Bookmark the permalink. Robin, what an unbelievably shocking and sad story. I hope you’ll keep posting about whether Lydia’s attacker was ever caught.